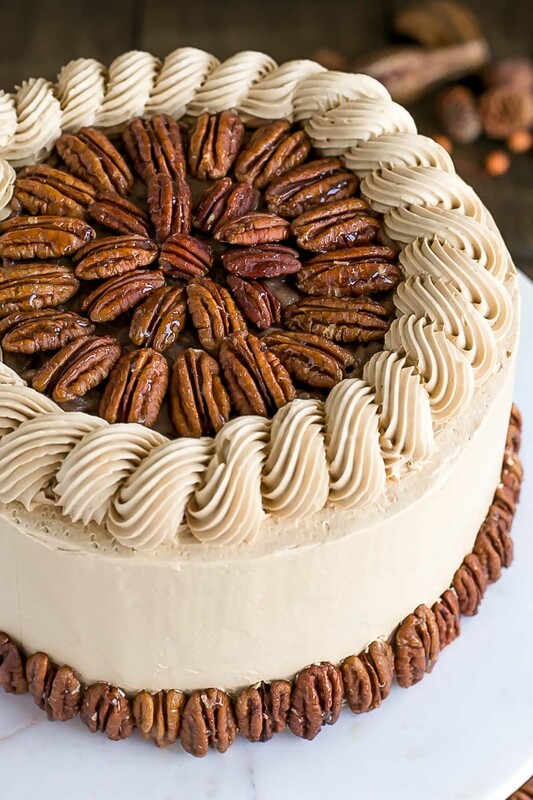 This Pecan Pie Cake is perfect for your holiday get-togethers! 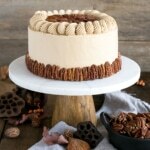 Brown sugar cake layers and buttercream filled with traditional pecan pie filling. Thirty dollars. 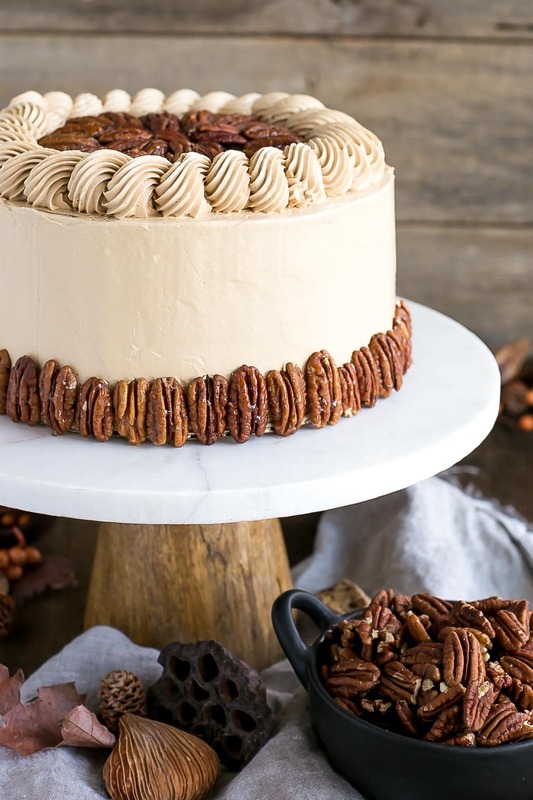 That’s how much I spent on pecans for this cake. I kid you not. Thirty dollars!! Is that crazy to anyone else? Ridiculous. The pecans were on sale, too. Good grief. I didn’t use all of them (most, though), but I always get more than I need just in case. In hindsight, I probably could have gotten a giant bag of them in Costco for less. I’m not complaining about it (only kinda), but more so this is a PSA for those people who don’t bake. Next time you ask your baker buddy to make a cake for you, be aware that the ingredients do not come cheap, never mind the time it takes to make the cakes too. And if they are making it for you for free, that is a good friend. You should cherish them and shower them with adoration and gift cards to their favourite baking store. 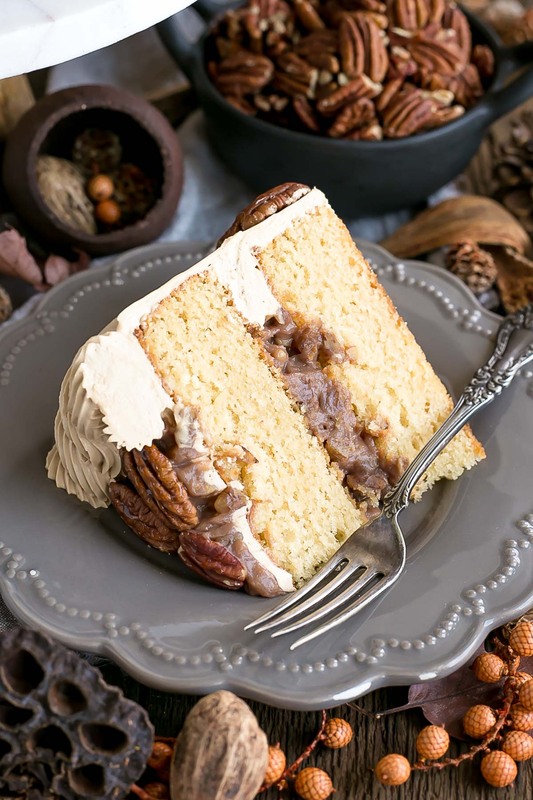 In my ongoing quest to stay away from pumpkin recipes this year, today I bring you this delicious Pecan Pie Cake! Pecan pie is my favourite Fall pie. It beats out apple pie (narrowly) and demolishes pumpkin pie (which I actually don’t like at all — it’s a texture thing). We never had pecan pie growing up, or any kind of Fall pie or dessert to be honest. Thanksgiving was a tradition that we adopted after we moved here. It’s not a part of Polish culture (obviously), but my parents happily accepted it and other Canadian traditions like Halloween when were growing up. For some reason though, we never got the pies! I feel totally deprived. I am sure you can sympathize. I must have been in my 20’s before I had pecan pie for the first time. I’ll be honest that it never really appealed to me before I had it. The filling looked weird, and I imagined the texture to be very unpleasant. Holy crap did I ever miss out. It is amazing!! What I pictured as a gooey gelatinous filling is actually more creamy custard-like, and it is amazing. Like, mouthwateringly so. 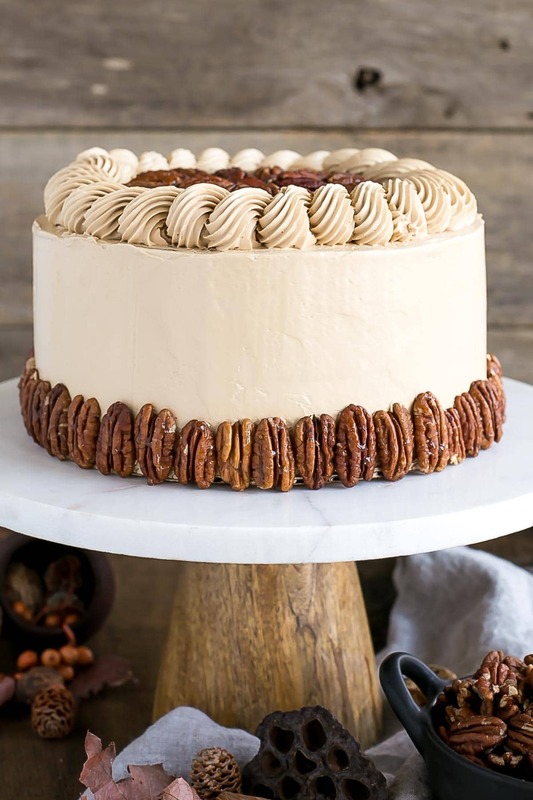 Since this is a cake blog and all, and I don’t enjoy making pies, I thought this would be the perfect opportunity to take all that is delicious about pecan pie and transform it into a beautiful cake. For the cake layers, I swapped out some granulated sugar and replaced it with (light) brown sugar to enhance the flavour and compliment the pecan pie filling. The frosting is also made with (dark) brown sugar instead of the traditional granulated sugar you see in a Swiss meringue. This gives it a richer flavour, but I also love the color it gives the frosting! I used the same one for my Walnut Cake. 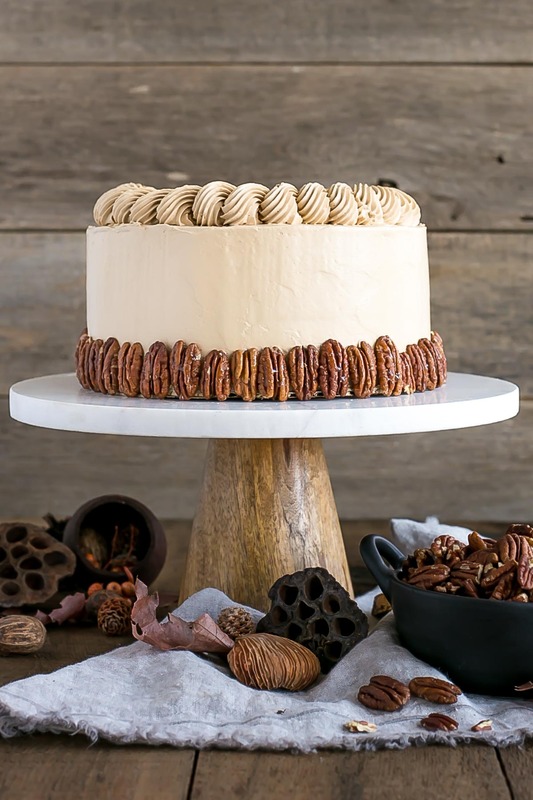 I chose to not put frosting between the layers of this Pecan Pie Cake, as I thought it would be a bit much in addition to the pecan pie filling. The filling is quite sweet, and I thought it would be overkill with the frosting there too. I found the frosting on the sides and top to be enough, but you’re more than welcome to slather some on that first layer too! The filling tastes JUST like a pecan pie. It’s pure heaven. 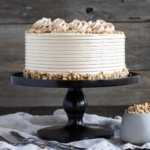 The brown sugar cake and frosting are a perfect compliment to it. 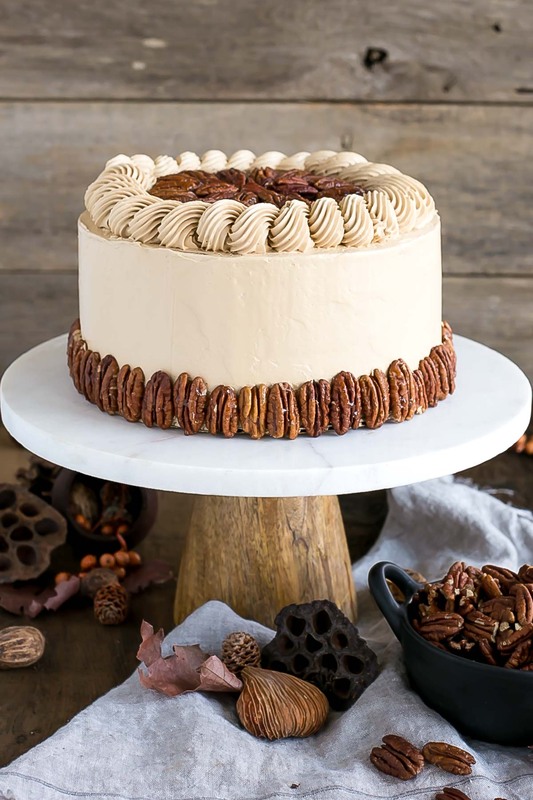 This Pecan Pie Cake is the perfect cake for your holiday baking, whether it’s for Thanksgiving or Christmas, or anywhere in between! You can make the pecan pie filling a couple days in advance, just keep it in an airtight container in the fridge. Bring to room temperature and give it a good whisk before using. I didn’t bother, but you can toast the pecans for extra flavour, especially the decorative ones. 350F for 5 mins or so, until they are fragrant. I used a Wilton 6B piping tip to do the rope border at the top of the cake. I didn’t do it the traditional way you might see in videos. I basically piped continuously in a circular motion, holding my piping bag at almost 90 degrees, while turning the cake. It’s kinda hard to describe, so I hope that makes sense! In a medium pot, whisk together water, egg yolk, and cornstarch. Add in brown sugar and chopped pecans and whisk to combine. Cook over medium heat, whisking constantly, until mixture comes to a boil. Boil, whisking constantly for approx. 1 min. Remove from heat and whisk in butter and vanilla. Cool completely before using on cake. Using a stand mixer fitted with a paddle attachment, cream butter and sugars on med-high until pale and fluffy (approx 3mins). Reduce speed and add eggs one at a time fully incorporating after each addition. Add vanilla. Place cakes on wire rack to cool for 10mins then turn out onto wire rack and cool completely. Place one layer of cake on a cake stand or serving plate. Pipe a damn of buttercream around the top and fill with approximately 2/3rds of the pecan pie filling. Place second cake layer on top and apply a thin coat of frosting all over to crumb coat. Chill for 20mins. Frost & smooth the top and sides of the cake. Do a rope border using a Wilton 6B piping tip. Chill for 20mins. Fill the middle between the rope border with the remainder of the pecan pie filling. Decorate top and bottom with pecan halves if desired. 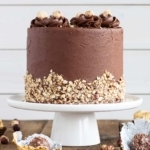 Can I make this as one cake in one pan instead of two? Hi Shallom! Yes, you may need to adjust the recipe depending on the seize and height of your pan. I made this cake twice following the recipe exactly and both times the cake did not rise nearly as much as it should’ve. I would have had to stack 3 of the 4 layers to get it to the right height. The filling was a weird texture and just sweet not rich like a pecan pie. I had to add molasses and salt to make it interesting. The buttercream was great though! Hi Lacey! Sorry to hear you had trouble with the cake — what size pans did you use? If the cake didn’t rise in the 8″ pans per the recipe, then it’s possible that your baking powder is expired or the batter was overmixed. The cake doesn’t rise a ton, but it should bake up to be roughly 1 3/4″ tall. Glad you liked the buttercream! Can you make this and put it in the fridge overnight ? Hi Stacy! Yes, you can store it in the fridge overnight. So I had to try this recipe and included your link to a post I made for it. It was worth every bit of prep and not too sweet (considering the amount of sucral goodness). You are a master for this! May the Gods bless you with a forever perfectly calibrated oven! Hi Bianca! Thanks so much, I’m so glad you liked it 🙂 Your version looks amazing! Hi Sylvie! The recipe as is would work perfect for a three layer 6″ cake. I can’t remember if I had much filling left over — I would 1.5x that recipe just in case since you’ll be doing another layer. Let me know how it turns out! Hi liv! The cakes turned out beautifully as 3x 6 inches but they were quite thick. Next time i would split each cake into 2 and add more of the pecan pie filling. I finally doubled the filling so would have had enough for the extra layers. Ah well, guess I will have to make it again ;). Thanks for the great recipe! I want to try and make this for Thanksgiving…it looks beautiful! I’m just curious if one could make regular butter cream icing and just add brown sugar? If so about how much do you think would do the trick? Hi Angela! The buttercream would be quite grainy if you just added brown sugar to an American buttercream as there’s no way for it to dissolve properly. Oh yeah…didn’t think about that. Lol. Hmmm. Oh well. My family just can’t do that much butter. Thank you for replying! Since the cake and filling are already pretty sweet how do you think a cream cheese frosting would taste as a substitute? I think cream cheese would pair really well! I am going to make this cake this week but I do not have 8” pans. Do you know how long to cook when using 9” pans? Hi Dana! The layers will be quite a bit thinner in 9″ pans. I would check them at 25mins or so to see how they are coming along. Do all swiss meringues have so much butter? My kids are frosting nuts and they couldn’t handle it. Hi Christina! This is a standard Swiss Merignue recipe. Actually, this one has less butter than most. You can adjust the butter somewhat to taste, but if it tasted super butter heavy I suspect it needed to be whipped more. 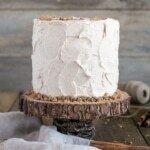 I am hoping I can make this cake for thanksgiving!!! Do you have a video of how you did the rope on top?! 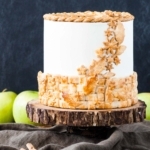 I’m in total awe of this cake and I can’t wait to try it!!!! I would love to make this recipe, but am confused on your measurements. How much is .44 cups? How much is .67 egg yolk,and 3.33 egg whites? Hi Claudia! Those are not the measurements in the recipe. It seems like you might have adjusted the servings slider by accident to get those numbers. I love the concept of this beautiful cake. So, I served it at my church harvest party for our youth this weekend. I did use my own butter cake recipe. It went over very well. And my goodness young-lady–my first time making Brown Sugar SBC…. this stuff is slammin’. I will definitely keep this supplied in my freezer.!! I am going to however, have to tweak the ‘mock’ pecan pie filling. (For me) because of the high water content and not nearly enough fat to add that ‘richness’ that this somewhat custard deserves…it was flat and weak in flavor I felt. Kinda surprising for such a beautiful cake. I think next time I am going to experiment by using only a few tablespoons of water or omit the water altogether and use cream, a few more yolks and butter… salt. Maybe a few tablespoons of Dark Karo. Or better yet….just make the ‘actual’ pie filling, bake it without a crust… scoop it in all in a bowl and cool it down…. YASSSSSS. I think I’ll do that. For your concept—its worth it… with that silky icing……um. Yeah. That’s what I’ll do. Anyway…. You are definitely a beautiful decorator… It’s why I chose yours over “Life, Love Cake” (I think that’s what her blog is called) version of Pecan Pie Cake but hadn’t compared the filling ingredients either. Yours frankly looked ‘richer’. I am going try some your other ‘beauties’ though. May GOD Bless your hands continually young-lady. Yes ma’am. I sure will! GOD Bless. Could I add chocolate chips to the pecan filling? I love chocolate chip pecan pie! Hi Ashli! Yes, and I think that would be delicious!! This Brown Sugar SMBC is amazing! I added 0.75 cups of a bourbon butterscotch sauce to 1 recipe’s worth of the buttercream and it mixed in like a dream and tasted fabulous (with and without the butterscotch)! Yay! I’m so glad that you liked it!! I need to try it with that bourbon butterscotch sauce — sounds amazing!! I made this last night for my aunt’s birthday which falls right around Thanksgiving. I must say it tastes and looks absolutely amazing. Thank you so much for this outstanding recipe – I will definitely be making it again! What a hit. The only improvement I will make next time is to shorten the bake time. Since everyone’s oven is different, I think mine sat in bit too long at 45 min. PS can’t decide if the delightfully light icing or the pecan filling is my favourite part. It’s all so good!!! Hi Britanie! I’m so happy to hear you liked it!! What a beautiful cake! I was just wondering if I could a buttercream frosting using butter, cream cheese and confectioners sugar instead of the Swiss meringue? Hi Gaye! I think that would work totally fine! Do you keep leftovers of the cake in the fridge, or on the counter? Thank you! Hi Caitlin! I prefer to keep them in the fridge (even though it tends to dry them out over time), but it would be fine on the counter for a couple days. The frosting may get quite soft though. back very soon. I want to encourage you to ultimately continue your great work, have a nice holiday weekend! This cake is absolutely positively one of the best cake I have ever eaten!! I can’t choose between the parts that make it my favorite…each one is perfection! Just thinking about it makes me want to get in the kitchen to have it again! This was delicious! I wish I had thought to candy the pecans I used as decorations. I think that would have put it over the top. Thanks for the great recipes! So glad you liked it Jeri! And I agree, candied pecans would be perfect!! This looks sooo good! Unfortunately I am allergic to corn is there a sub that can work in place of the corn starch? I want to use the cake recipe for cupcakes. Bake time for cupcakes? Hi Alexis! Start checking the cupcakes at 15mins. You might go online and look at Ellis Brothers Nuts in middle Ga. You might find the nuts cheaper. They are open year round and they ship nuts. Love the store in person-always have samples of the nuts. It may be more expensive-just not sure. This cake looks amazing. Happy Holidays. Best cake ever. Will definitely make this over and over again. Thank you for sharing. Hi Linda! Thanks so much, I’m glad you liked it! This cake is stunning! I changed it up a bit by using some sugared pecans I made. It will be my Thanksgiving SHOWSTOPPER! Yay!! I’m so happy to hear that! Love the sugared pecans idea. Hi Inna! Was the meringue stiff when before you added the butter? If so, it sounds like maybe it was just a bit too warm. Stick the whole thing in the fridge for 20mins and try whipping again. And another 20mins after that if still too runny. 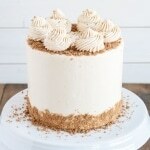 I absolutely love Swiss Meringue Buttercream and this looks fantastic! I’m making this tonight for Thanksgiving and hope that it will become a new traditional dessert. Could you please do a quick tutorial of the frosting? Would love to make this for thanksgiving next week! 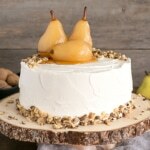 I recently made this cake & the Almond Almaretto Cake for my daughter’s school dessert auction. They were beautiful! They sold for over $50 each! Thank you for creating such elegant cakes! I wish I had a way to share pictures of them! I see the filling can be made ahead of time. Can the cake itself be made in advance? If so, can you provide instructions for prepping/baking? Hi Hailey! You can make the entire cake a day or two in advance and store in the fridge. However, the fridge has a tendency to dry cakes out, so I would do it a max of two days. Alternatively, you can make the individual components in advance and assemble on a different day. – The filling can be stored in an airtight container in the fridge (bring to room temp before using on the cake). – The cake layers can be baked weeks in advance, wrapped twice in plastic wrap, and frozen (bring to room temp before assembling cake). – The frosting can be made a few days in advance and refrigerated. 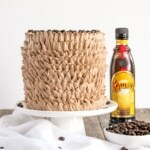 Bring to room temp and rewhip before using on the cake. Make sure the frosting is actually at room temp, if it’s too cold when you rewhip it, it could separate. If so, you’ll need to warm it up a bit and rewhip again. I would recommend doing the filling and cake layers in advance and the frosting on the day you plan to assemble (just easier that way). I hope that helps! 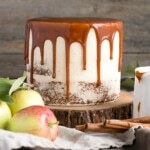 I am including a few of your desserts in my fall round-up (from MV group) and I Just have to say that I am total awe of your beautiful cakes and food photography. Your work is impeccable. I can’t wait to follow along to see what you’ll do next! Thanks so much Laura! Your comment made my day 🙂 Please send me the link to the round-up so that I can share it!! This may seem like a silly question, but for the double boiler part of buttercream, do set the mixing bowl in another bowl or do you place the bowl on the water? Thanks so much for the reply!! Being a southern girl, I make pecan pies all the time. I cannot wait for Thanksgiving to make this delicious treat!!! I made this last week. Pecan pie is probably my favorite. This cake was just as good, but with added fabulous icing makes it one step better!!! I’ll make it again!!! I’m so excited to try this cake! What did you do to the decorative pecans to make them shiny, they look so beautiful?! Hi Heather! I just brushed them with a thick sugar syrup for effect, but it would be best to candy them. I made this pecan pie cake yesterday for our thanksgiving dinner, and everybody said it’s their new favourite. Thanks so much for sharing the recipe. So happy to hear that Neliza! Glad everyone liked it 🙂 Happy Thanksgiving to you! Thanks for sharing this great receipt. Kind to share such a beautiful Cake. I love pecans. God Bless. Aww thanks so much Peggy, I really hope you get a chance to try this one. It’s delicious! What a gorgeous (and pricey!) cake. I love the combo of a pie-turned-cake situation and it looks sooooo delicious. I’d love to see a video of the rope icing technique. Thanks so much Cindy! I gotta get on that video! Would love to see this tutorial! Hoping to make next week for thanksgiving! Gente que maravilha, fico impressionada como pode algo tão lindo e gostoso, uma verdadeira obra de arte, que maravilha, excepcional. Thank you so much Haille! !